It has been another record-breaking year for the Headwaters Health Care Foundation (HHCF) as the dust begins to settle on their spectacular 21st annual ‘Headwaters Goes Hollywood’ hospital gala. 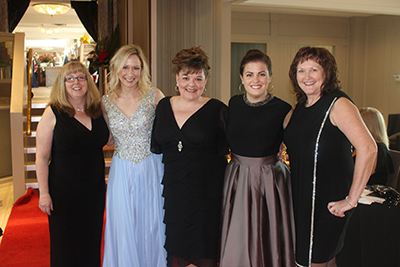 Last Saturday evening (May 5), no fewer than 402 guests crammed their way into Hockley Valley Resort as HHCF – the main fundraising arm of Headwaters Health Care Centre (HHCC) – welcomed individuals from across the community for an unforgettable evening of glitz and glamour. While entertainment was plentiful and a good time was had by all, when it came down to it everyone in attendance remembered the real reason they were there that night. And they remembered it in a big way. The annual gala serves as the premier fundraiser for HHCC. Each year, the Foundation commits to donating a fixed amount to the hospital to purchase necessary equipment and carry out important renovations so as to continue to meet the growing needs of the Dufferin-Caledon community. A live auction boasting three impressive packages sold very well on the gala floor, while all 140 silent auction items were claimed by evening’s end. More than $5,000 was raised through a true-or-false game that promised a pair of Air Canada tickets to the eventual winner, while the night’s special wine raffle also sold out. “We are so thankful to this amazing community. They stepped up in a massive way once again at our 21st annual gala,” Ms. Hand stated. Perhaps the most memorable part of the night came just prior to the popular ‘Field Hospital’ blitz, where those in attendance are able to contribute to, or outright purchase necessary pieces of equipment. This year, the Foundation listed one bassinette, at a cost of $4,000, one centrifuge unit, at a cost of $8,200, or $820 per share, a ‘workstation on wheels’, at a cost of $8,400, or $420 per share, wheelchairs at $600 a pop and, finally, the biggie – a fetal monitor at a cost of $25,000, or $500 per share. There was a big surprise prior to the big night event, as a member of the community stepped forward to pick up the entire cost of the fetal monitor. Prior to launching the ‘Field Hospital’, a video aired telling the story of local resident Dave Woods, who had his life saved by doctors at HHCC. And what an impact it had. The hospital raised enough money to purchase four bassinettes – three more than they initially planned. Locals purchased “more wheelchairs than I can count,” said Ms. Hand, while also buying several shares in both the workstation on wheels and the centrifuge unit. Most notable was the effort to bring in money for new state-of-the-art beds at the hospital. Coming in at a cost of $10,000, Ms. Hand revealed the foundation raised more than $150,000 over a 10-minute period, which would enable them to buy 15 beds for the facility. Stacey Daub, HHCC President and CAO, reflected on what she described as an “extraordinary” gala, going on record to thank those in attendance for their incredible contributions to their hospital. A final net total for the 21st annual Headwaters gala will be revealed next week. The 22nd annual hospital gala will be held on May 4, 2019. The committee charged with organizing the event will be meeting next week to reflect on another hugely successful evening and get plans under way for 2019. For more information on Headwaters Health Care Foundation, visit hhcfoundation.com.